written by – Rangers Report photo courtesy of: News Group Newspaper Ltd.
Part of the promise of analytics is the idea that you can use data to find diamonds in the rough…players who may get overlooked by the mainstream could be savvy pick-ups for teams looking to get a competitive edge. Often the best place to mine for these diamonds is by honing in on underperforming teams. Last place Ross County would be one of these teams. Despite being doomed to a relegation spot, their underlying numbers suggest that their performances are actually closer to teams like Hearts & Kilmarnock – who both are currently sitting in the top half of the league table. Below you’ll see an illustration of how much Ross County has underachieved this season from Fitba in Scotland, who uses Expected Goals data to determine Expected Points. 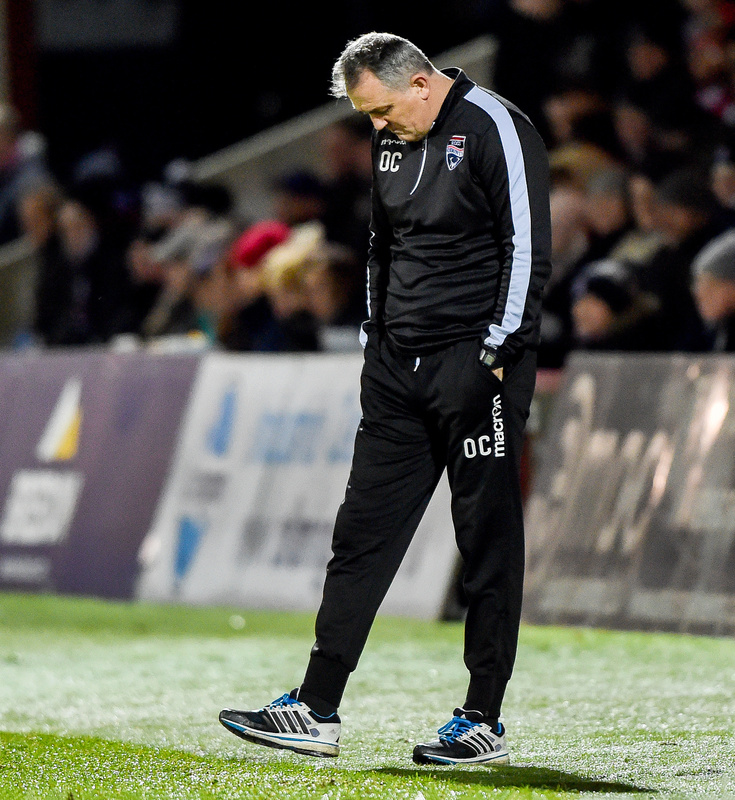 The data doesn’t suggest Ross County is among the top teams in the Scottish Premiership, but it does highlight the fact that they have clearly underperformed this season. They have scored 2.96 less goals than their xG & have allowed 10.06 MORE goals than their xG allowed. They have the fourth lowest xG created for this season but that’s not the issue. 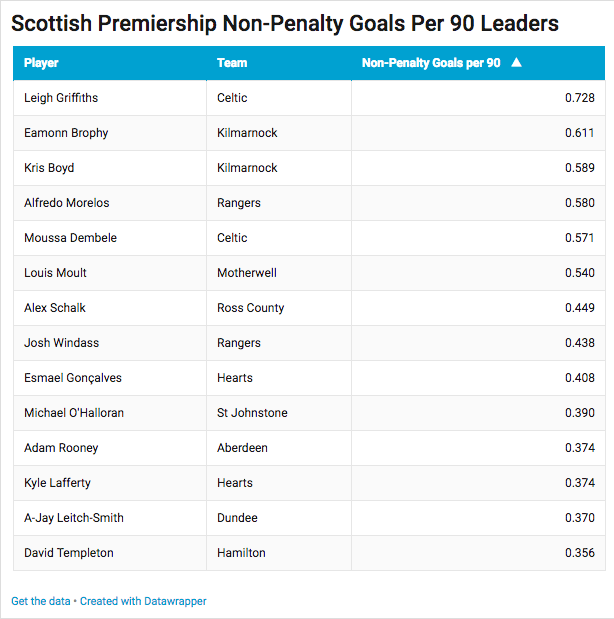 Their Expected Goals Allowed is actually lower than teams like Hearts & Hibs. They do a good job of limiting chances, but you would never guess that when you look at the fact that no team has allowed more goals. If Ross County can figure out why this discrepancy exists, they should become a much more competitive team. Knowing this…makes Ross County an ideal club to mine for talent given that they may be overlooked because of their spot in the league table. After Owen Coyle’s departure, I posted the following graph on Twitter. It uses xG Impact data & compares it with how many minutes a player gets. I recently discussed this approach in a post that compared Graeme Murty & Neil McCann’s lineup decisions. Don’t feel like clicking on the link? An abbreviated description is that xG Impact combines a player’s Expected Goals with their xG Chain numbers & then breaks that down to a per 90 ratio. 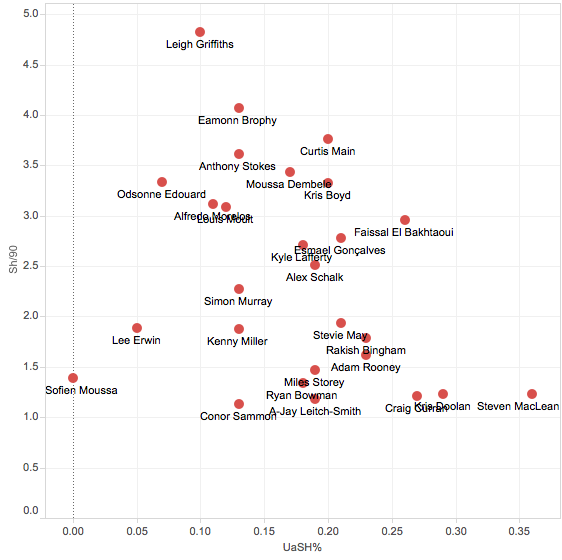 It’s an attempt to see what players are having a tangible impact on chance creation (& vice versa). This is what initially put Alex Schalk on my radar. 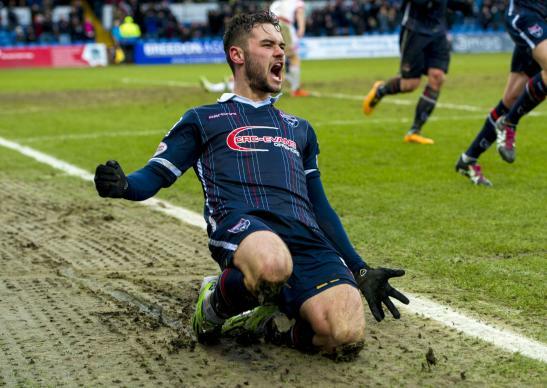 Ross County had played the majority of the season without Alex Schalk in the lineup…but when he did get minutes he had a significant impact. 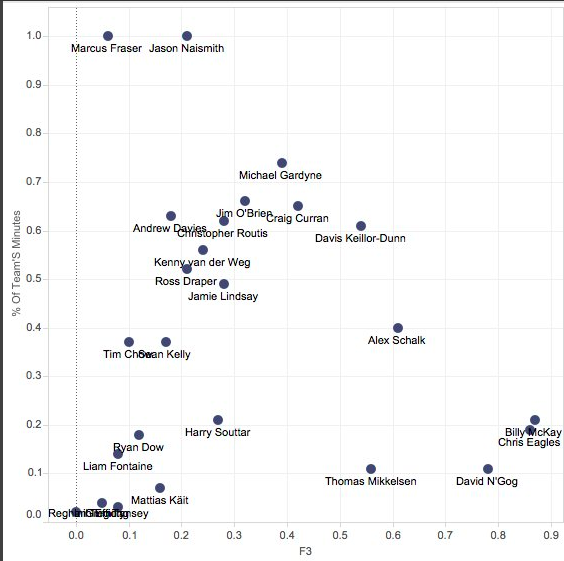 The only players who have a higher xG Impact per 90 for Ross County are Billy McKay (who can’t bribe his way into the lineup for some reason), Chris Eagles (who has been brilliant since signing but has since seen his minutes disappear) & David N’Gog (who just signed & provides some real hope that he can help save Ross County’s season). All three of those players have played less than 600 minutes, which makes Schalk’s impact a little more impressive given he’s played 1,000+ minutes. The 25-year old popped up again when I did another dive into another set of data. The objective for this one was to find some “indie forwards” – forwards who don’t rely on service from their teammates to create shots. Given how certain teams in the Premiership truly lack playmaking talent, there is a need to find forwards who can find ways to get their shots on their own, or “independently” –> hence the name “indie forward”. Below you’ll find a graph that features all forwards with at least 15 shots this season & then what percent of their shots are unassisted. Shots are displayed in their per 90 rates. Note: free kicks do not count as unassisted shots. Only seven forwards in the Premiership average more than 2.0 shots while creating more than 15% of those shots on their own. Dundee’s Faissal El Bakhtaoui, Esmael Goncalves (who now plays in Uzbekistan), Kyle Lafferty, Kris Boyd, Moussa Dembele, Motherwell’s Curtis Main & Schalk. Now, anyone who has watched Dundee play this season would take serious pause seeing El Bakhtaoui grouped with a player & making a claim that’s a good thing. Yes, he creates a lot of his own shots but they usually are low percentage shots that you probably don’t want your striker taking. El Bakhtaoui has a pretty miserable Conversion Rate on unblocked shots (8%) & what makes that number sadder is the fact that his Expected Conversion Rate is…..8%. For context, Shalk’s Conversion Rate on unblocked shots is 19%, while his xCR of 16%. Both rates are on a whole different level than El Bakhtaoui. So this data inquiry is only the beginning. The next step I took was to compare these forwards Goals Above Average with the rate of shots that are unassisted. Goals Above Average (GAA) measures how many more goals per 90 a player scored that is above the average rate for a forward in that league. Over the past four seasons, the average goals per 90 for Scottish Premiership forwards has been 0.34. Someone like Alfredo Morelos averages 0.58 goals per 90, so his GAA is +0.24. Applying this kind of stat can give you a sense of how good a striker’s goal scoring rate actually is. 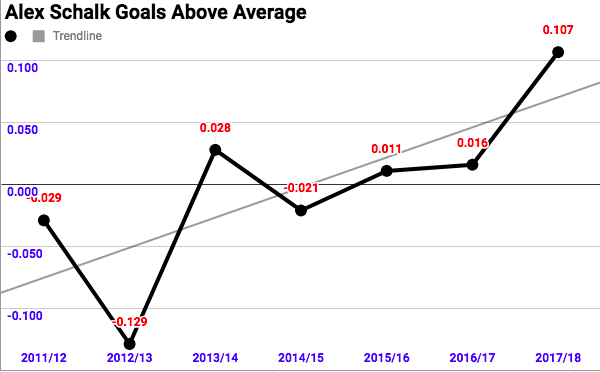 This is something I introduced this summer when assessing Morelos’ scoring output in Finland where he had seasons of +0.70 & +0.29 Goals Above Average. The average goals per 90 for forwards in Finland’s Veikkausliiga 0.43 – so they score at a higher rate there than in Scotland…which makes Morelo’s numbers even more impressive. The cluster in the middle is Kyle Lafferty & AJ Leitch-Smith. It should also be noted that Goals Above Average only accounts for non-penalty goals. First off, finding a diamond in the rough among forwards in the Scottish Premiership is more like finding a needle in a haystack. 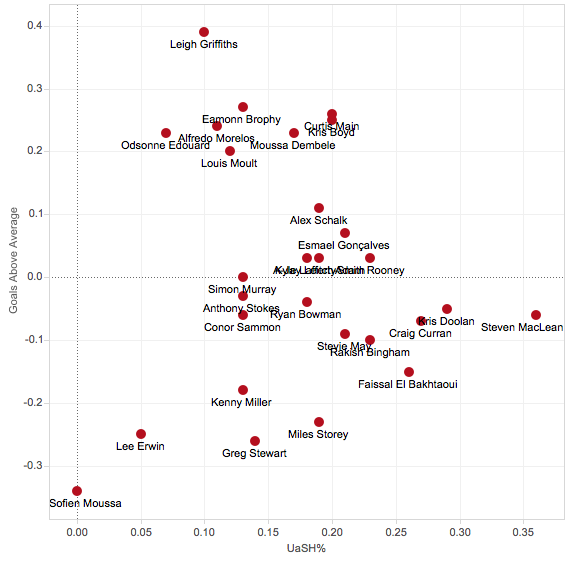 The names you see that are scoring at an above average rate are mostly household names in Scottish football (Kris Boyd, Adam Rooney), or play for Old Firm clubs (Morelos, the trio of Celtic forwards), or have already signed with other teams (Moult, Goncalves). Curtis Main has been very, very good for Motherwell since joining in January, while Eamonn Brophy is a player that I touted for more first team minutes back in early September (at the time he had only played 30 minutes for Lee McCulloch’s Killie – I guess Jig should have subscribed to the blog). Then, there’s Alex Schalk. He hasn’t been in that top tier of forwards this season, but he kind of is situated right in the next tier below them on his own. Of course, this is only based on the roughly 1,000 minutes Schalk has played this year. Given that Schalk is 25-years old & has played regular first team minutes since the 2011-12 season, it is imperative to see how his goal scoring has trended over his career. Below you’ll find his Goals Above Average rates, first in the Eredivisie, then a season in the Jupiler & then the past few seasons in the Scottish Premiership. The average Goals per 90 for Eredivisie forwards over the past four full seasons is 0.372, for the Jupiler it’s been 0.377 & for the Premiership it has been 0.342. In Schalk’s first two full seasons, he was a below average Eredivisie forward as a 19/20 year old. In his lone full season in the Jupiler, in a level below, he was a slightly above average striker for that level. He returned to the Eredivisie in 2014/15 & once again was a below average striker. In 2015/16, he entered the prime years of his career & also signed with Ross County. In his two full seasons, he has been slightly above average & now as a 25-year old, is having a career year. 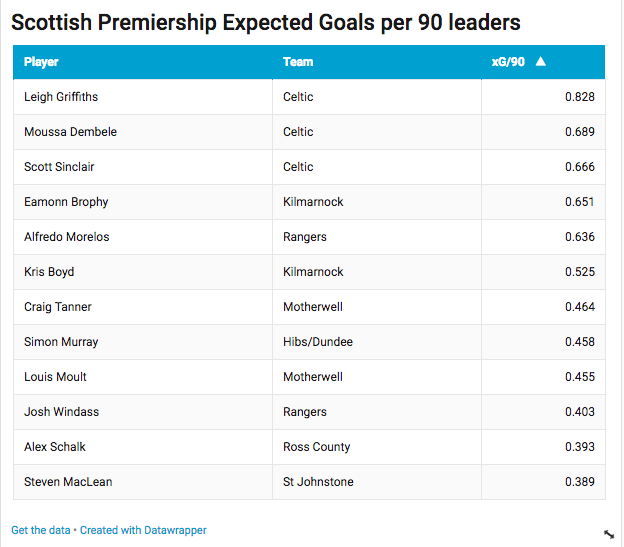 For some context, Schalk’s output in the Premiership prior to this season was basically at the same level as Kenny Miller last season for Rangers when he averaged 0.36 goals per 90. Ok…but check this out — Schalk’s Goals Above Average as a 24-year old is similar to Louis Moult’s GAA at the same age (Moult’s was +0.02). To take that comparison to another level, if Schalk can sustain his scoring rate this season, his Goals Above Average would be similar to Moult’s output as a 25-year old. Schalk’s current GAA is +0.11, Moult’s was +0.10 at 25. Did I mention that his contract expires at the end of the season? Now, remember the original premise of this post is that I’m playing with data to identify the self-creating, “indie striker.” Given how many teams in the Scottish Premiership lack true playmakers, having a forward who can find ways to get shots on his own adds a unique value. What do some of these unassisted shots look like? Take a look at the video below. Even though this is a Rangers blog, the objective of this post is to model a process of using data to drive a recruitment process. The next step would be to scout this player at a deeper level. I do not think that Alex Schalk is necessarily a player that Rangers should target. He could be a useful squad player for a team like Rangers, but I think he’d actually be a much better target for non-Old Firm Premiership clubs. Teams like Dundee, Hearts, Hamilton, St. Johnstone, & Partick Thistle would be wise to add a player like Schalk to the top of their wish list this summer. Each of these five clubs lack a player like Schalk, who could fill a similar role to Josh Windass for Rangers or Eamonn Brophy for Kilmarnock. Windass has thrived in a hybrid #10/secondary striker role, while Brophy’s inclusion in the lineup has not only led to individual success but also has helped Kris Boyd regain his form as one of the top goal scorers in the league. Additionally, of the five aforementioned clubs – you could argue that there are only three true playmakers currently getting regular minutes (Ali Crawford, Blair Spittal, & Liam Craig). The point is these are teams that would be improved by adding a forward who doesn’t exclusively rely on the service of others to create chances. Let me leave you with a couple more sets of data as an appendix to consider. One includes the goals per 90 leaders in the league this season (regardless of position) & the other lists the top xG per 90 generators. You’ll see that Schalk’s closest contemporary on both lists this season has been Josh Windass. Not bad. Imagine how much better those clubs would be with a Josh Windass in their starting eleven. 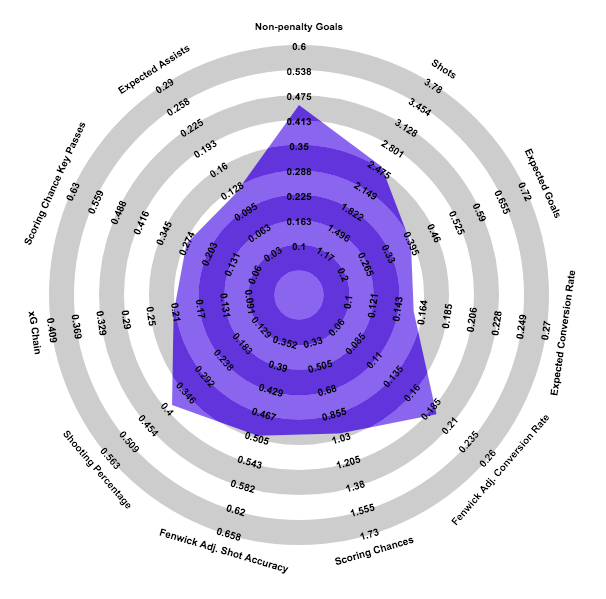 Then, since we all love a good stats radar, I have added one to show a more complete picture of Alex Schalk’s season in relation to other Scottish Premiership forwards. Both tables are based on players playing at least 800 minutes. Again, remember the teams we are talking about who should explore interest in Alex Schalk: Dundee, Hearts, Hamilton, St. Johnstone, & Partick Thistle. These are teams that can’t necessarily appeal to elite level forwards to sign-on. Schalk’s production has been very good & has been trending in the right direction since arriving in the Scottish Premiership. He is the 7th leading scorer based on goals per 90 & has the 7th highest xG per 90 for forwards in the league. What’s promising in his underlying numbers is the fact that he is not riding abnormally high Conversion Rates (rate of shots that are goals) or Shooting Percentages (the % of shots on target that beat the keeper). What is probably the most enticing finding in all of this is the fact that his production mirrors Louis Moult at the same age. If one of the aforementioned teams take that kind of calculated risk & it pays off, it likely means a top six finish & an opportunity to profit on a free transfer. That’s why searching for diamonds in the rough can be fun!